At Ortho 101 in Grande Prairie, we recognize that orthodontic treatment is an investment. We will work with you to develop a customized payment plan that meets your needs so you can have the smile of your dreams! Following your initial consultation for treatment, we will discuss all of your financial options. 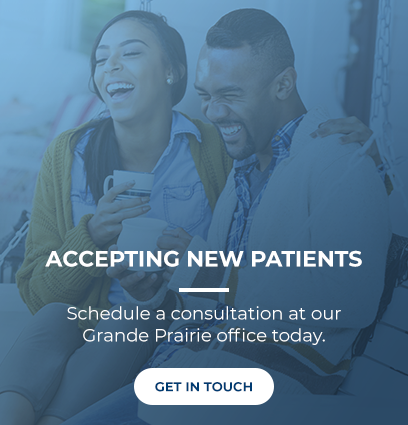 During this time, we will help connect you with your insurance provider to determine what orthodontic coverage they can offer you and a customized monthly payment plan. We want to ensure we discuss all necessary financial information, insurance options, and payments up front, so there are no surprises! What's New at Ortho 101! Can Jaw Discomfort Be Related to a "Bad Bite"? Are you hearing more clicking and popping from your jaw joints? Do you find it hard to yawn in the morning without enduring shooting pain? Jaw joint discomfort can be debilitating and be triggered by a host of factors – one of which is a bad bite. See your smile before and after treatment using the Invisalign® Outcome Simulator.